Christie’s Latin American Art Sale scheduled for Nov. 15th and 16th,, 2011 includes two paintings previously exhibited at ArtSpace/Virginia Miller Galleries. 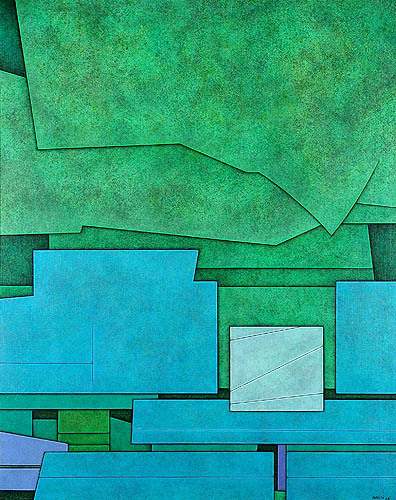 Gunther Gerzso’s “Verde-azul-blanco,” a 36 1/2 inch by 28 7/8-inch oil on canvas shown on page 79 of the auction house’s sale catalog, was featured in “Gunther Gerzso: Defining Mexican Abstractionism,” from February to May 2004. The gallery’s exhibition included 86 paintings, including this geometric abstraction, along with drawings, including many from the artist’s 1935-41 period being shown for the first time. Considered a pioneer in Latin American abstraction, Gerzso’s notation in the auction catalog states that he is “considered one of the ‘Nuevos Tres Grandes,’ along with Carlos Merida and Rufino Tamayo.” The essay goes on to note the artist’s younger years in Europe, six years at the Cleveland Playhouse, his career as a highly successful set designer for popular Mexican films, and his association with Mexican Surrealists Remedios Varo, Leonora Carrington, Wilfgang Paalen and Benjamin Peret. Claudio Bravo’s spectacular “Red Carpet,” a 1980 oil on canvas of a shirtless, sprawling man on a scarlet rug, was included in “Master Works 1969-1984” at ArtSpace/Virginia Miller Galleries from October to November 2002. The 51 1/2 by 64 1/8-inch painting is shown on pages 100 and 101 of the Christie’s catalog. The Chilean artist, who moved to Tangier in 1972, was a master of hyperrealism. His works, which often feature exquisitely detailed young men, Moroccan carpets and pottery, are included in such collections as the Metropolitan Museum of Art and El Museo del Barrio in New York, the Baltimore Museum of Art, and the Museo Nacional de Bellas Artes in Santiago, Chile.